The styling is awesome IMO but wont suit anyone who prefers a more sedate look. They are very shiny, featuring a red metalic type vinyl around lower section with a gloss white vinyl for upper section. They have a unique side lacing system and velcro closure strap. The strap has PUMA logo across it and the logo is in a carbon fibre type finish. 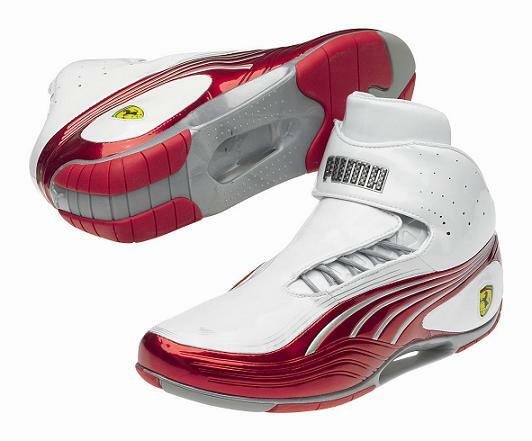 On the inside of the arch they feature the puma cat design in silver over the red. On the other side they have a Ferrari prancing horse emblem embedded on the side of the heel cup. As they are a driving shoe, the sole extends up the rear. The middle of the sole features a unique dual flexible bridge type of arrangement between the front and rear sections. The Puma SL Tech Mid Replica SF shoes are not like many athletic shoes, that often feel like you have put your feet into soft pillows. They are a lot firmer but I still find them very comfortable. The set up of laces and strap means I can adjust them so they fit perfectly. The PUMA SL Tech Mid Replica SF old model is still available on Amazon but I cannot find this model, as I think they may be too new. These kicks are similar to another recent purchase I made of a pair of PUMA Speed Cat 2.9 Mid RBR, as they are both Formula one replica racing shoes. I am a very loyal Red Bull fan and love my Red Bull kicks and wear them all the time, and always on race days, as I cheer on Mark Webber, but when I am heading out, I find myself reaching for the Puma SL Tech Mid Replica SF .